It was another beautiful sunny day in Dinan. After breakfast I packed my panniers for the first time. Carefully. My belongings barely fitted in the saddle bags. It was pretty obvious that I wouldn't be able to buy any souvenirs on the trip. Before loading the bikes we walked them across the street to the empty square where the market had been yesterday. I rode my bike in circles around the square while trying to avoid workers who were painting parking lines. I had some trouble shifting at first, but as soon as I got the feel, it went fine. 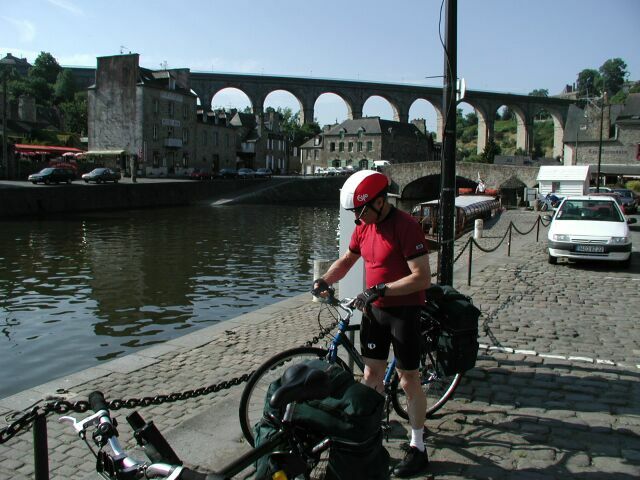 Then we loaded up the bikes and got set to leave Dinan. 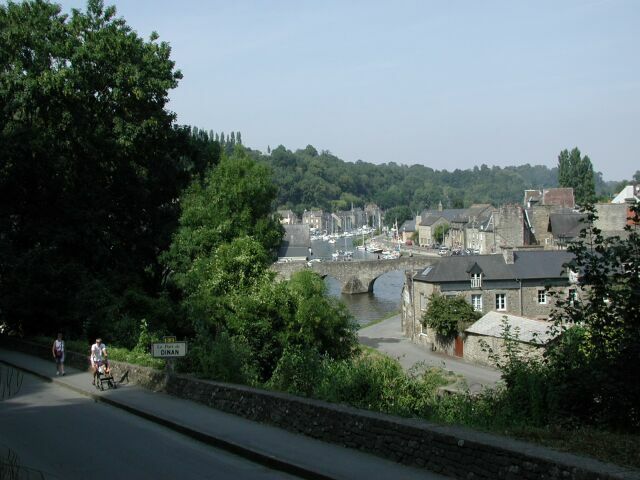 Dinan is perched on a hill above the river Rance, so we had a flying start to biking heading down this road. At the bottom of the hill we dismounted, partly to admire the beautiful scene at the river bank, but also to set our GPS receivers. 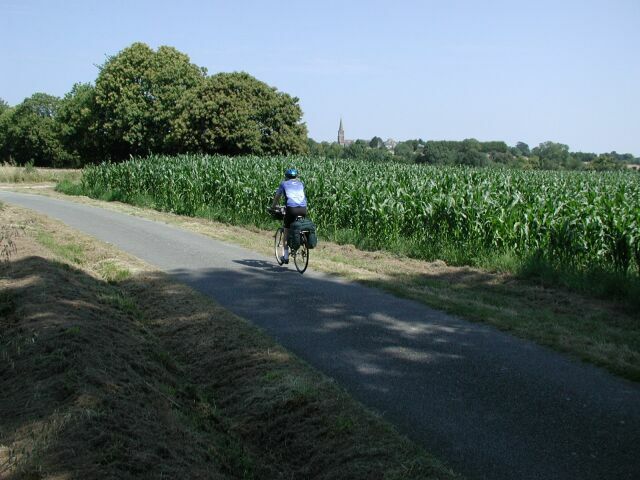 I had a Magellan GPS 315 that I had used in three previous European biking trips. 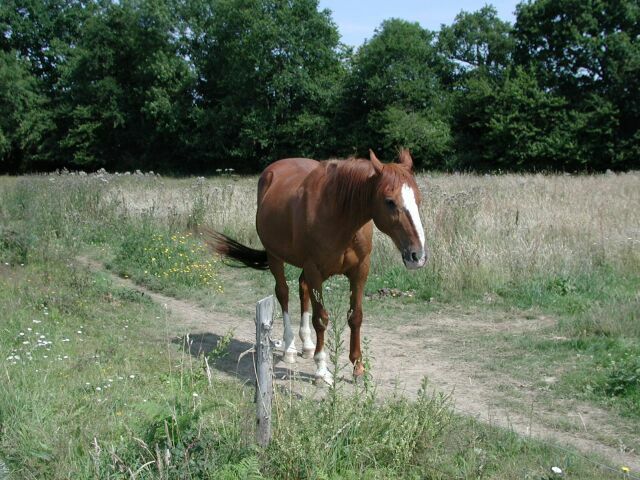 I had pre-programmed it with the route that we would follow during the week. Len, on the other hand, had a Palm Pilot computer with a GPS add-on receiver. The advantage that his gave was that he could see map segments, whereas mine just showed the squiggly line indicating our route together with my current position. I also had key landmarks programmed, but no map. While his could show the map, it was also tricky to use and kept running out of battery power. Since it was brand new, Len had had no previous experience with it, and often stopped to fiddle with the settings during the trip. He also had a very cute gadget for recharging the batteries using a photocell and sunlight. He perched this gadget on top of the panniers while he biked. It required numerous readjustments as we went along, and I don't think it ever worked. It was cute, though, I have to admit. I had a certain apprehension about proceeding from here, because I knew that the hardest hill of the day lay in front of us. 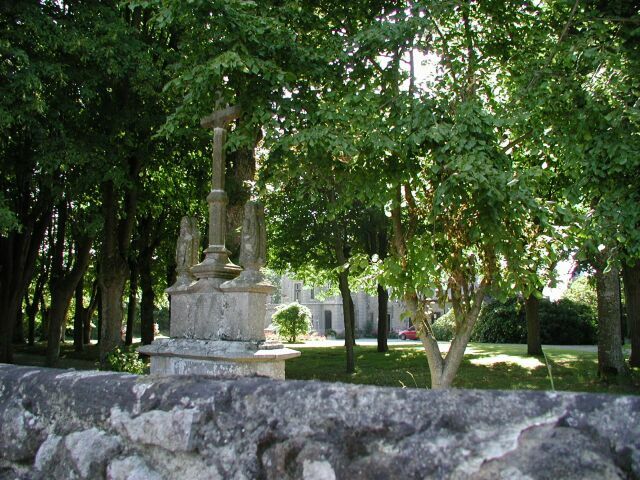 It was a long, moderately steep hill that would regain the height we had lost coming down from Dinan. I didn't know how I would fare on this bike. As I pedalled up the hill I descended through my gears and reached the lowest gear when there was a lot of hill left to go. But this gear was sustainable; it was only a question of endurance, and when I reached the top I felt a certain sense of accomplishment. Now I knew that the rest of the day would be fine. 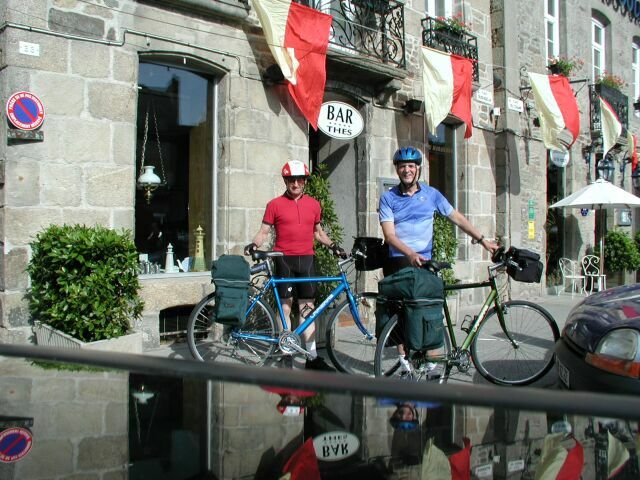 The trip from Dinan to St. Malo is a very short one of only about 21 miles. Ordinarily this would have been too short a day to schedule, but there really weren't any other destination-class stopping places on the road we were going to be travelling. 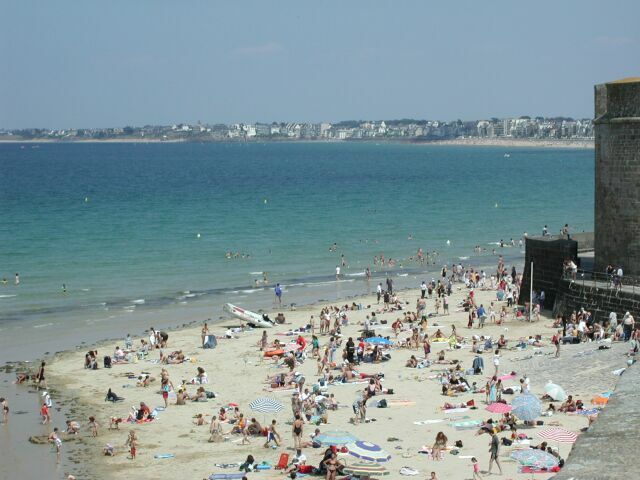 You practically have to break your trip at St. Malo. 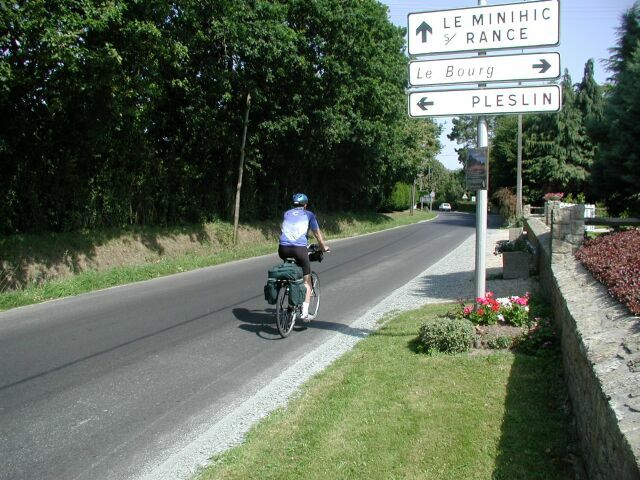 Besides, this particular day was a recommended route in two different biking books that I had consulted beforehand. We were following the same path recommended in each of these guides. I can't help imagining a trip before I begin. I had a certain pre-conception about what this road was going to be like. I even had the advantage of the route description in the two guide books. In my mind this was a busy highway, passing through busy little towns, traversing dangerous roundabouts, steep hills, and with lingering views of the river far below. In actuality it was none of these things. It was a very pleasant small road with almost no traffic, gentle rolling hills, no towns that I can even remember, and only the occasional view of the river far away. There were corn fields, farm animals, and every now and then a manor home like this one. Here are a couple of the typical views on this delightful road. We missed a turn on the road at the top of the first hill and ended up in tiny village with a private school. Even with two GPS and a very detailed map, sometimes the markings aren't all that distinctive and you can get led astray. But on such a beautiful day as this, even a wrong turn had its rewards. Often the best sights aren't the tourist attractions in the famous towns, but simply the passing everyday scenery on the country roads. 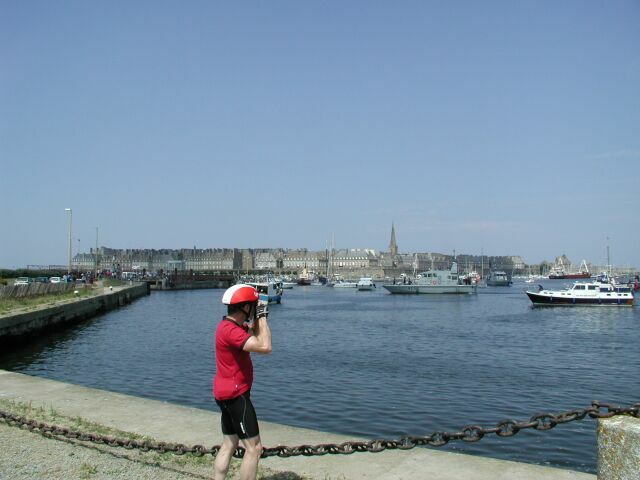 A little after noon we reached the bridge across the river to St. Malo. I had a pre-conception of this bridge also, because one of the guide books had said that this bridge was windy and "rather frightening." I pictured a high, arched suspension bridge with lots of traffic and no shoulder for bikes, and I imagined a gale wind blowing bikes off the road. Again, it was nothing of the sort. It was the most ordinary bridge -- too ordinary even to imagine. It was flat and only a dozen feet or so above the water. It had four lanes and there was quite a bit of traffic, but there was a shielded pedestrian walkway at the side. 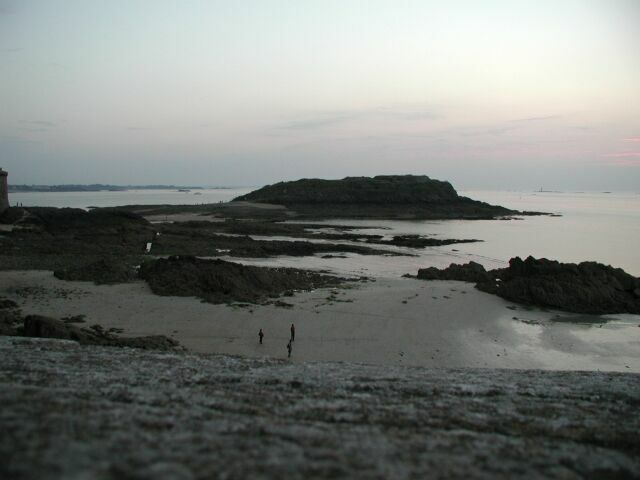 Here I am sitting on the side of the bridge with St. Malo on the far right. I biked along the pedestrian walkway on the other side of this bridge. It was quite narrow, so that there were only inches to spare on each side of the handlebars, and since the concrete divider was shoulder high, it was like biking along a chute. I had to maintain my bike absolutely straight. After I got across I looked back for Len, and he was far back, walking his bike. He had started to bike, but kept running into the sides so that he got all scratched up. He said that his bike wasn't very stable. On the other side of this bridge we had to climb a hill that led away from St. Malo, and then descend through the city streets north to the old walled city that was our destination. There was a causeway that led across a channel to this ancient part of town. Here is Len, taking a picture along the causeway. We had to wait here for about ten minutes while a section of the road rotated by 90 degrees in order to allow boats through the channel. We watched some expensive pleasure boats drift through as we waved. We waved in French, of course. 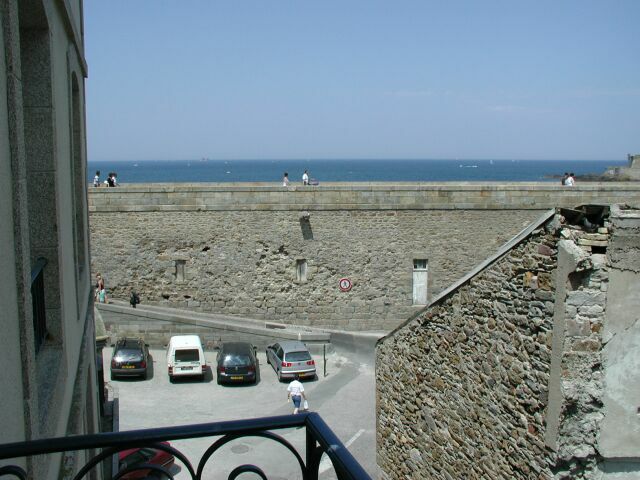 On the other side of the channel we biked through the city walls and across to the far walls bordering the sea. Right inside these outer walls, signs led us toward our hotel. They said (in French) "other hotels this way." That was us. After a little ways we found our hotel, the Hotel de la Cite. We parked our bikes outside the hotel, and I went to remove my handlebar bag from the bike. It unclips, and since it contained all my valuables, I always took it with me. Unfortunately, I didn't realize that the bag itself was open, and when I removed it from the bike everything tumbled out onto the sidewalk. "Everything" sadly included my digital camera, which bounced with a threatening sound off of the concrete. My heart sank. It was an expensive camera and a prized possession. I held my breath and turned the camera on. It made a series of beeps that was out of the ordinary and the screen said "error". Damn, it was broken! Len consoled me, saying that I could have copies of all of his pictures, so I wouldn't miss anything. Of course this was true, but provided very little consolation. Sadly, I walked my bike into the hotel garage and locked it up. What a way to ruin this beautiful day! Walking back into the lobby I examined the camera and discovered that the little door to the memory card was open and the memory was unseated. I reseated the card and the camera turned on. I took a trial picture and it seemed to work OK. It was a few days later before I really trusted it, but I have to give Olympus credit for making a camera that can survive being dropped from waist high onto concrete. But don't try it! From my balconey on the second floor of the hotel I got my first view of the sea. I couldn't wait to get out and walk along the walls, but I was also starving, so we looked for a simple restaurant to get a quick lunch. Len really never needed lunch, but he was always accomodating. We headed along a city street to an area replete with outdoor restaurants, which all seemed very full. We got a sandwich at the one on the right. Walking the walls had been a pleasure postponed by the lunch, but now it was time. Below us were beaches with sunbathers, small islands, and the bay stretching towards Mont St-Michel, which we strained unsuccessfully to see in the far distance. The "ghosts" in this picture are artifacts from the stitching of the panorama. This is actually a small part of a 360-degree picture made up of 11 separate photographs. When people walk by as the pictures are taken they appear in one segment and not another. It is possible to minimize the ghosting effect by tweaking the software that stitches the pictures, but I didn't trouble to do that. Here's a closer view of one of the beaches we passed. At this time we didn't realize what a great effect the tide would have, such that the beach would completely disappear for part of the day, while at another time the sea bottom would be exposed for a great distance. 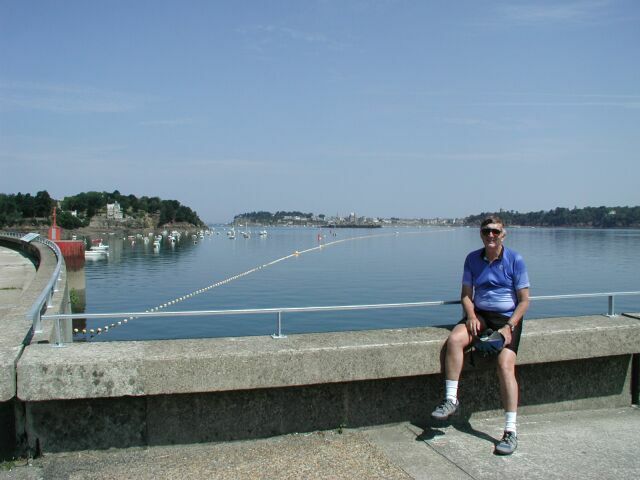 We walked about 270 degrees around the walls of the old city, passing the inlet to the river, the view of the town of Dinard across the inlet, and then seeing hundreds of pleasure boats moored on the landward side of the walls. 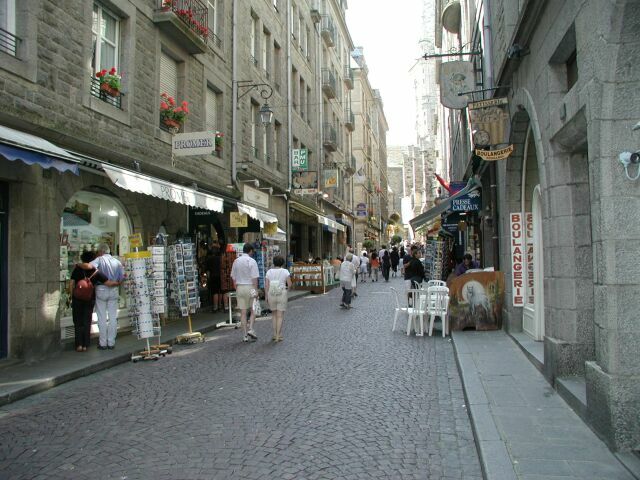 We then descended and walked some of the narrow streets, which were characterized by a mixture of tourist shops, like the one on the left, and the ordinary staples like the boulangerie on the right. 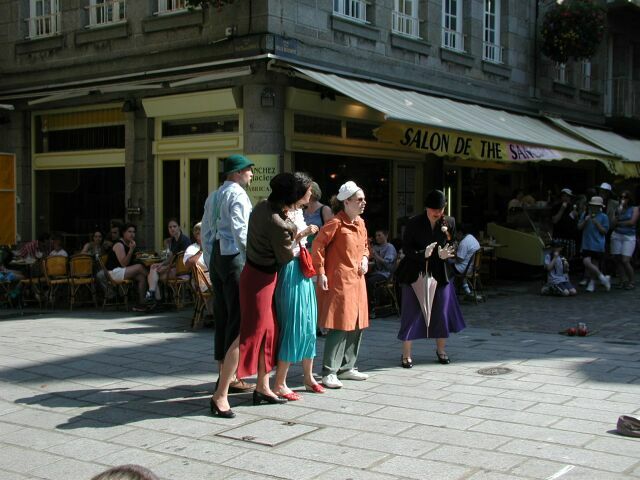 On one street corner there was a troupe of Irish youths, singing and acting out some play in English. They were actually pretty good, and I admired their enthusiasm, but we moved on. Nearby was a cathedral, and inside someone was playing the organ, which always adds so much to the atmosphere of an old church. The contrast between the bright sun and beaches so nearby, and the dank darkness of the church was profound. It wasn't possible to stay very long. Hurrying onwards we stopped to buy a map for the next day's trip, and I couldn't resist a bag of nougats that I nursed for the next two days. As we worked our way back to the hotel, we saw these two meter maids writing up parking tickets. Only in France would meter maids look like this! After a short rest at the hotel we walked over to the main square of the old city, which was surrounded by restaurants of all types, from pizza to elegant. We chose a restaurant named after the square, Chateaubriand. The name certainly had its attractions in terms of food also. 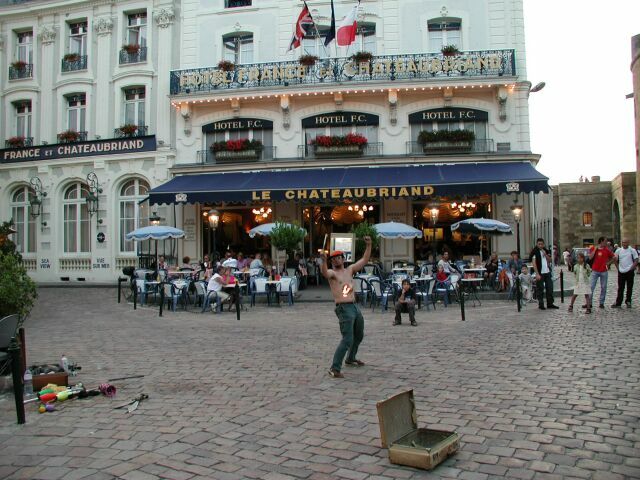 Of course, that was what we ordered at our outdoor table, and as we ate we watched various performers in the square. After dinner we walked for a while in the darkening town. 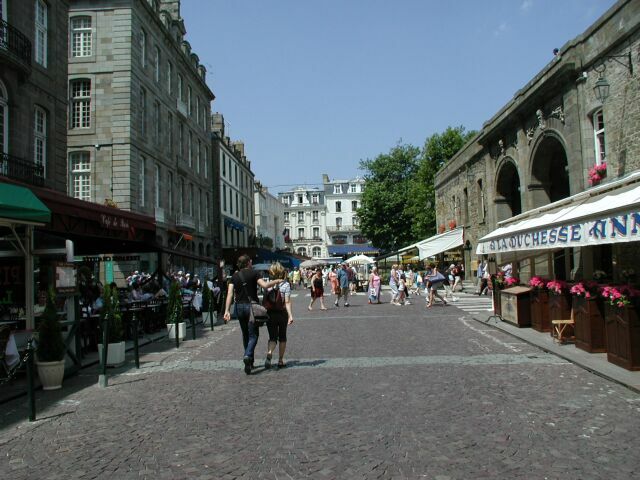 While the sidestreets were now quiet, there were throngs of people milling about the many restaurants and bars. We took one final walk up the walls, and were surprised to see how far the tide had gone out, and how the view had been transformed from the small sunlit beaches we had seen earlier to the extensive mudflats that now lay before us.